When I bring my husband to Farmers’ Markets or craft shows that will have food vendors, I know we better have full wallets. Just the other day we made a quick trip to our local Farmers’ Market for 2 things and 2 things only. Just as we were about to head out, a question came from behind a table selling salsa and we immediately stopped and headed over. Although we weren’t in the market for salsa, we ended up buying some anyways. So what was that question you ask?…..
Would you like to try some of my salsa? Food is a little easier to apply “would you like to try _______” to than something like jewelry, however you can still find an appropriate question, regardless of what you sell, to get shoppers to stop in their tracks and head over. 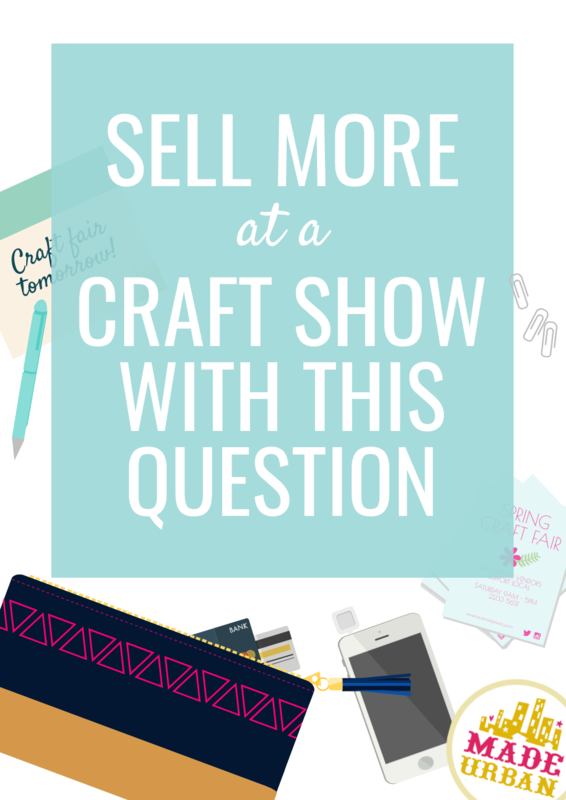 Keep reading for tips to apply a shopper-stopping question to any product! If we weren’t big salsa eaters, we would have politely declined and kept walking. However, my husband loves chips and salsa as a snack so he gave it a try. It was of course delicious and we walked away with a jar, regardless of the fact that we have 2 full jars at home. She didn’t even have any “spicy” salsas left, which is my husband’s favorite. She had sold the majority of her stock and only had 3 lonely jars of mild salsa left sitting on her table….and she still made a customer out of us! While he was taste testing, she didn’t get overly salesy, she just told us a bit about the ingredients and how she makes it. 1 – Who turns down free stuff? The first step to getting a sale at a craft show is getting them to stop at your table. If you don’t have free food to offer, think of another question you can ask that will pique their interest. Can you give away something small like a pin or bookmark? If the event allows it, you could even offer a small food or beverage item. Would you like some chai tea to sip on while looking at my photos from India? If you can’t give an item away to each customer, consider holding a draw for 1 larger prize and ask shoppers if they’d like to stop and enter their name. Once they’re at your table, take a second to tell them about the product they’ll be winning or what it is you’re selling. The prize should be something unique that won’t have people entering the draw instead of purchasing. Think outside the box. It should be something people want to win. Not many people will be lining up to win a $5 item from last season. Make it worth their while. Share the odds. I’ve been handed ballots to enter a big grand prize from a lot of stores but almost never end up entering. You know why? I figure the odds of me winning are extremely low. I’m not going to sign up for a newsletter I don’t want to be on for a minuscule chance of winning. If the giveaway is just for craft fair shoppers, they probably have really good odds (unless the event goes on for days and you’ve signed up thousands of people). Let shoppers know they have about a 1 in ___ chance of winning at the moment (if that number is good). If it’s not a fit for you to give an item away, what type of knowledge can you share for free? Maybe you can show them something interesting like how one of your products is made, or even how it works. Would you like to see the difference between single and triple plated jewelry? Feel the difference between my cashmere scarves and acrylic scarves…there’s a sample right there. Have you tried charcoal soap before? Most shoppers don’t want to be rude and will take a minute to stop and listen. Don’t take advantage of this though; pick up on their cues and take pauses so the shopper has a chance to say “no thank you” or keep moving if they want to. I once had a vendor selling Norwex cloths stand in my path so I had to stop and continued talking my ear off, not giving me a chance to say “no thanks” or “sounds good, I’ll look around”. Her pushy tactics ended up annoying me so much that I didn’t buy…even though it was the first time I had heard of the product and did in fact find it interesting. It doesn’t take a whole lot of courage to ask the question and if people aren’t interested, they’ll just keep walking. The first few that turn you down may be a bit harder pill to swallow but it will get easier as the day goes on. The majority of people are not going to turn down the chance to try something for free, get something for free or gain some knowledge. If offering a sample isn’t a fit for your business, brainstorm questions that are quick and easy to ask, and feel natural. “Can I put you in a new hat and scarf today?” is not a natural question to ask and feels extremely salesy. “Have you purchased organic wool products before?” could be a better fit and get shoppers interested. This is the whole reason large companies are willing to send out free samples. Once you get the product into consumers’ hands, they have more confidence in their purchasing decisions. Homemade and handmade products have qualities you just can’t beat when comparing to mass produced. When you can show people the difference and they experience it firsthand, it encourages them to purchase because you’ve lowered the risk of them buying something they’re not going to like. If asking a question simply isn’t a fit for your product, don’t force it. It will feel unnatural for you and the customer and have the opposite effect and push shoppers away. The feedback has been amazing and I’ve loved receiving all the emails from people telling me I’ve given them a lot to think about. You can read a bit more about the free challenge here or sign up below! I did the freebie’s. They are something small and not got a lot into them. The more I gave out the more the people stop and look at my products at my booth. We gave out our business cards with them. I got a lot of feed back even after the show….Thanks for the tip…. That’s so great to hear Carolyn! Glad the tip helped, thanks so much for sharing! I like your idea! I plan to try it at my next show. Thanks for sharing! Great tips! I’ll be sure to do this. I produce unique crochet items like toys, games, children’s items, one of a kind household items, etc. I have made a children’s fishing game where the “fishing pole” is made from a stick and has a magnet at the end (fishing hook) picking up the fish which have a washer crocheted into their “mouths.” I ask everyone who passes if they’d like to go fishing. I almost have no one that doesn’t stop, young and old, and this allows me to get them into my booth to see my products. Most of the time the kids are fishing and the parents are looking over my wares. Since I started this, my sales have nearly doubled. Once they are in my booth I ask if they crochet or knit and it always starts up a conversation where we become familiar with each other. My “freebie” is allowing them to play the game. The benefit is great customer interaction. I love your books and newsletters. They have helped me immensely. Thanks for reading MacKenzie and Peggy! Good luck at your next event! That’s a great idea Peggy! 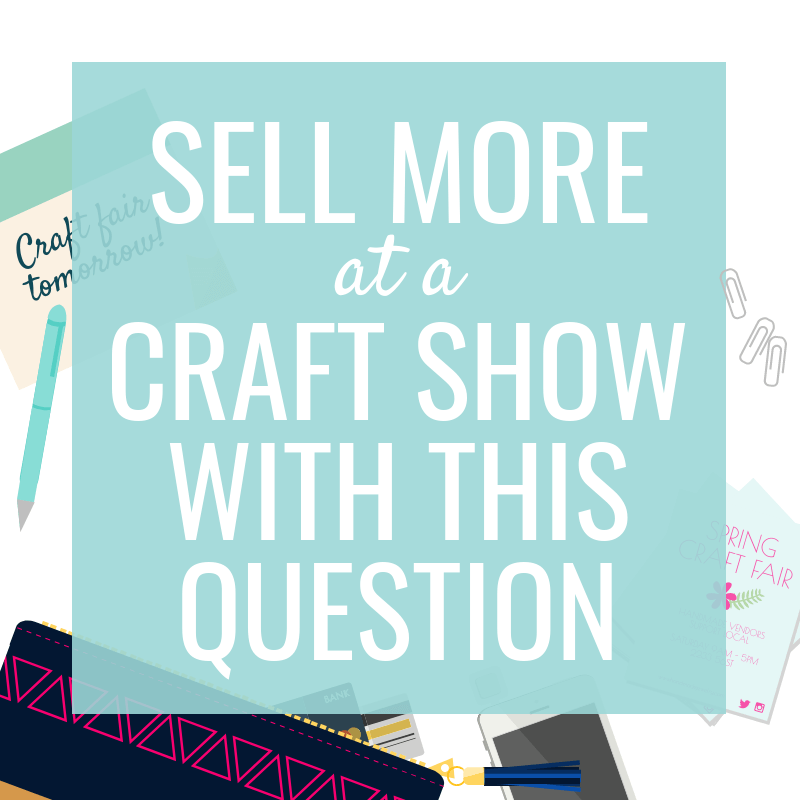 Craft shows are such a unique atmosphere and you get shoppers who want to interact and discover new things (not like shoppers rushing through a busy mall with an intention). Perfect example that you don’t have to give away free stuff to pique interest; interaction, an experience, etc. work too! My products r hand painted & decorAted bottles with homemade footbath salts inside. Giving away footbath salts is costly. What would I give away? I love this idea!! I have a home start-up called Butterduckie and I do laser cut state puzzles and I’ve been racking my brain on the best method to draw in customers, as I gear up for my first ever craft fair in October. I would love to do a “beat the challenge, and get something” . I can see this being so much fun!! Thanks for the great idea! I make rice heating pads & Burp Cloths. How can I display them so people can see them as they are walking around? Hi! I have done your 5 day Challenge and loved all your valuable information! I want ALL your publications! Do you have a package so I don’t miss any tips? Hi La Rae Moncada! Thank you so much for your interest, I’m happy to hear you enjoyed the 5 day challenge!